Beside the St. Concordia Church in Ruhla there are four further angle churches in Germany: the town church in Freudenstadt (Black Forest), the Evangelical Church in Elsfleth (Lower Saxony), the Evangelical Church in Rohrdorf (district Calw) and the Evangelical Church in Unterschuepf (district Tauberbischofsheim). Freudenstadt lies in the Black Forest. Duke Friedrich of Wuerttemberg in 1599 gave the order for the building of this city. Town planner was the ducal building master Heinrich Schickhardt, who sketched also the church. The laying of the found for the building of the angle hook church in this concise place resulted from the situation of the market place so intended from the duke. What is characteristic is the outward open course dragging on at the inside of the angle under the gallery, a part of in all market place houses inserted arcades which are led around the whole place, which is called in Freudenstadt the "archs". 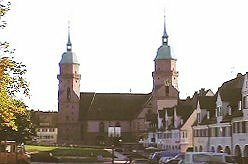 With the laying of the foundation stone of the town church (02 May 1601) the actual upswing for the city began, which received on 06 May 1601 the name "Freudenstadt". The inauguration of the town church took place 7 years later, on 01 May 1608. The 1504 established Nikolai church became an angle church in 1690 by extension. Thus the interior became larger approximately on the double. If one would have extended the narrow church, which was not possible perhaps from ground, a little satisfying area would have developed. That one decided for the angle church, probably was the better solution. The earlier choir disappeared as a result of the alterations and pulpit and altar was now set up, where the old and the new wall meet. The church tower remained at the end of the old part. Probably it were practical reasons to choose the angle form. Whether the churches in Freudenstadt or Ruhla affected the decision, is uncertain, but among experts the strange building method might have been known quite well. The 1311 to John the Baptist dedicated church belonged to the monastery of the Order of St. John. After the reformation, in Rohrdorf in 1556, it was agreed upon that the church may be shared by the Evangelist ones, too. Because the common church use did not remain problem-free, the wuerttembergische duke obligated the commander in 1738 to build at his expense a second church or by change of the existing to create two churches. The East part with choir was separated by a partition as catholic church from the remaining church ship and over the wall as tower for both churches a ridge turret was installed. Evangelist church became the part which was extended beyond the wall. Because of the situation of the city hall, once monastery, the extension under an angle of 160 degrees took place. The building leans against the city hall and forms with this together a structural unit. The church differs from the other angle churches because of very the obtuse angle substantially. This church, which perhaps goes back to an older of 807, developed at the end of the 13. Century and became an angle church in 1617 by a change, similar to the church in Elsfleth. The tower at the end of the old church part remained also here. It is remarkable that the angle of both church ships amounts to to each other not 90 degrees, but 95 degrees. Independently of it, which reasons may have led to the choice of this angles, the severity of a right-angled architecture was moderated and it developed a pleasing church room. Contrary to the other angle churches with same wing length, the large new part is dominating in Unterschuepf. The old is become the secondary room. The pulpit originally set up behind the altar with a renovation 1961 for acoustic reasons to the transition from the main area to the secondary room was placed. The difference of the five angle churches among themselves consists of the fact that the churches in Ruhla and Freudenstadt were planned and built according to the local conditions (difficulties while building at the rocky mountain-slope in Ruhla and inclusion into square market place architecture in Freudenstadt). All other angle churches resulted from changes or extensions on places of worship already existing. Only the angle churches in Ruhla and Freudenstadt are strictly taken "genuine" angle churches. Because the town church in Freudenstadt, 1945 by a heavy bomb attack very strongly damaged, after 2. World war had to be reconstructed, is thus the St. Concordia Church in Ruhla the only one of all five angle churches, which remained still in the original building condition. Note: The translation of this text was done through the translation software Babelfish by Altavista. We apologize for any inconvenience.